Patrick (Pat) Speer has been working in the Computer Industry since 1975. He received his B.S. degree in Physics from The Ohio State University with a focus on computational physics. His extensive software experience includes architecture, project management, and software systems analysis, design, implementation, and training. Pat serves as CTO and senior technical consultant for developersDen, providing direction in business analysis, and solution architecture and design for their product development efforts. In this conversation, Patrick discusses DynaPoint, an add-in for PowerPoint. Geetesh: Tell us more about DynaPoint – what it does and why you created it. Patrick: Our team spent a number of years working with Office Automation. During that time we were fortunate to have the opportunity to work intimately with PowerPoint and gain a high-level of expertise with its programming model. As we used the product, and its many features, we began to evaluate the approach taken by Microsoft with the user experience related to these features. One valuable capability that we took a close look at was that of slide reuse. We realized that many PowerPoint users were not even aware of this capability and that fact coupled with some of the requirements that Microsoft levied on the technology, made the feature difficult to use, inflexible, and for some functionality, unattainable. Thus was born, DynaPoint. 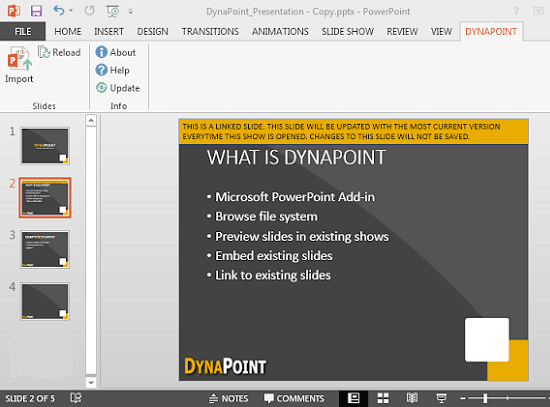 DynaPoint is a PowerPoint add-in that allows for simplified browsing of local drives, mapped drives, network shares, and even FTP sites, for PowerPoint presentations and the ability to preview the slides within them, without actually opening them within PowerPoint. We decided that the browsing capability should be available to all PowerPoint users at no extra charge. For a small registration fee (introductory price of $29.95), the user gains additional functionality which includes the ability to incorporate existing slides into new presentations. Slides can be included as static embedded slides or dynamic linked slides. Embedded slides retain their existing content, while dynamic slides are updated to reflect the current content of their source, each time the show is opened, or on demand. As mentioned previously, the source location for including slides is very flexible and never requires the use of SharePoint Slide Libraries. Geetesh: How is using DynaPoint different than using SharePoint’s Slide Libraries? Patrick: Well, to tell the truth, we are not trying to replace any existing PowerPoint functionality, but rather enhance it. While we felt that embedded slides are certainly useful, the true power of slide reuse is realized by dynamic linking. When you think about business or education where regularly scheduled presentations are commonplace, such as in status meetings, budget meetings, etc. and while the focus of the presentation is fairly static, but the content needs to be current, dynamic slides can save countless hours of effort. PowerPoint has the native ability to leverage SharePoint Slide Libraries to accomplish this type of behavior. Our concern with Microsoft’s approach, was that the dependency on SharePoint alone to provide users with this capability was extremely limiting. First of all, not everyone uses SharePoint, which has a fairly high cost of ownership. Secondly, even if SharePoint is available, forcing users to use SharePoint Slide Libraries to gain dynamic content capabilities ignores the many other storage facilities, such as mapped drives, file shares and FTP sites, or other cloud-based storage options. 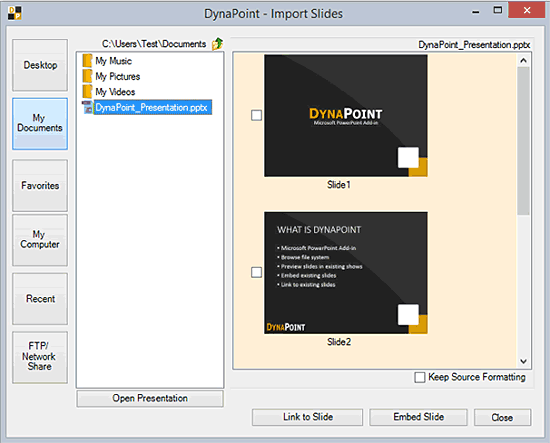 With DynaPoint, users are free to continue to use the slide capabilities that PowerPoint provides “out of the box”, and incorporate the additional functionality, flexibility and intuitive interface of DynaPoint. Of course everyone can make use of the DynaPoint Browser functionality, whether or not they choose to license the full product.